The yin and yang symbol is normally known to be related to life in a negative and positive manner. 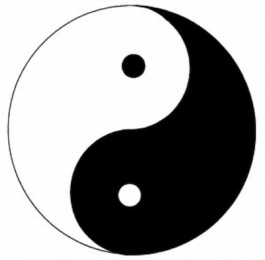 With yin being the negative energy and yang the positive energy, balance will occur if both arise equally. This wholeness where balance exists is depicted in the outer circle which surrounds the black and white shape within the circle. The interaction of these two energies are constant and is an unavoidable occurrence. On another note, it should also be mentioned that on a closer look, there is a small white dot in the yang symbol and small black dot in the yin symbol. Thus like in life, things are never completely black or white (or right or wrong). If we take a moment to think about our daily experiences, we will realise that the enrgies of yin and yang exist constantly. For instance: cold and hot, moon and sun, dark and bright, feminine and masculine, contraction and expansion, water and fire, passive and active, below and above. With this, I would like to encourage my fellow yogis to incorporate the concept of yin and yang in your daily lives. I will explain a few examples of daily life activities which we can look into with the aim of finding balance. Being brought up in a chinese household, my mother always boiled us cooling herbal drinks on hot days or when we fall sick to ‘cool’ the body down. The chinese refers to the body being ‘heaty’ in that situation. It might not be understood by the europeans or westerners as they drink cold water to cool their body down, which is considered a no no in chinese medicine. On the other hand, when the body is considered cold, we will be given ‘heaty’ herbal drinks. hence the balancing of yin and yang of the body. The symptoms of heatiness are irritability, nose bleeding, constipation, sore throat, fever, rashes, ulcers, indigestion, hyperactivity and rapid pulse. Example of cooling drinks to have is chrysanthemum tea, coconut juice, white tea, boiled barley, boiled sugar cane and lemongrass drink. The symptoms of excesssive cold energy in the body are weaknesses, tiredness and slow pulse. Example of ‘heaty’ drinks to have is boiled ginger or longan drink. In general, inhalation is yin and exhalation is yang. But when the body is not well in terms of having excesssive cold or hot energy, breathing exercises can help to create balance. This can be done with the sun breath (surya bedha pranayama) or cool breath (shitali pranayama). In my observation as a yoga enthusiasts, people are more inclined to practice yang yoga which encourages muscle contractions (to work on muscle tissues), high energy levels and perspiration i.e. Hot, Ashtanga and Power Yoga. However, yin yoga is slowly gaining popularity, with the requirement of holding poses longer and having a calm energy. not only that, as yin yoga requires the relaxation of muscles while working on lengthening connective tissues (ligaments, tendons and fascia). Therefore, if you have had a busy day running around doing your job, yin yoga will be beneficial to help you recuperate and wind down towards the end of the day. In general, learn to listen to your body in deciding whether to have a yin or yang yoga session. I hope that these simple tips to balance your body will similarly help benefit your mind and soul in a greater way. May we all live in a balanced and harmonised environment, not only with humans, but also with other living beings. Many places in China, such as Luoyang, contain the word yang, and a few, such as Huayin, contain the word yin. This is a very old way to assign place names. Classicaly, when used in place names, yang refers to the “sunny side”. The word “tai yang”, refers to the sun, and literally means “great yang”. In the northern hemisphere, sunlight comes predominantly from the south, and so the south face of a mountain (or a north face of a river valley) will get more direct sunlight. Therefore, yang means a place is on the south slope of a mountain (or on the north bank of a river valley). For example, Luoyang is on the south bank of the Luo River valley. In the same way, yin would be the opposite, the “shady side”. Yin means that a place is on the north slope of a mountain (or on the south bank of a river). For example, Huayin is on the north slope of Mount Hua.